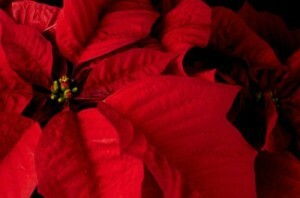 Poinsettia plants are the widely known Christmas flower. While they are most popular at Christmas time, they can grow outdoors in the warmer months as well as indoors in the colder months. Many people are used to seeing this flower is a foil covered pot with nice thick stems and very large and brightly colored petals and leaves. What some people may not know is that this plant is actually a shrub. While being in its shrub form, the plant can grow even taller than it’s usually height of 2 to 3 feet. Another thing different about this plant that many people do not know, is that the actual flower of this plant is actually in the center of all those beautifully broad petals. When you look at the top of the stem where the petals sit, if you take a peek in between all those petals, you will see the small flower of the poinsettia. The colorful petals are simply just that: petals. 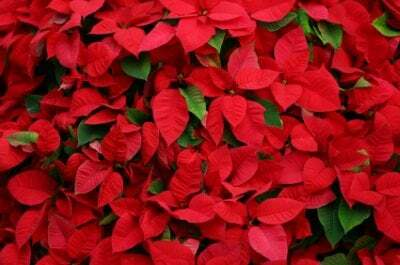 Older versions of this plant used to grow only in that bright, Christmas red color. Today however, there are many cultivars that grow in a nice Creamy white, or even a white with a blush pink hue. I believe that in some places you can even buy a pink poinsettia. Poinsettia care involves a lot of sun and warmth in order to grow. If you are in a climate where it cannot grow outdoors and you need to grow it indoors, your best bet is to place it in a window that gets a lot of sun. Filtered sun is better than direct sun. To maintain good Poinsettia plant care they need to be in a room where temperatures are at least 65-70 degrees during the day, with a 10 degree decrease in temperature at night. This flower does go through a period of dormancy, but will grow again with proper care. They go into dormancy once they have reached full bloom. When the color on the petals begins to fade away, stop fertilizing the plant and water it only enough so that it doesn’t dry out. You also have to move the plant to a cooler spot that gets a little bit of sun. In spring when you see new growth coming in, cut back stems and repot it in a new pot. Then you can put it back in the spot where it used to grow and you can water and fertilize the plant again. During the growing period, you want to make sure the soil stays moist. Don’t soak the plant, just keep it evenly moist. In the summer a fall months, you also want to fertilize the plant about once a week with an all-purpose fertilizer.